Use 3rd party maps/total conversions with Duke Nukem 3D. Is there a better alternative to DN Map Loader? 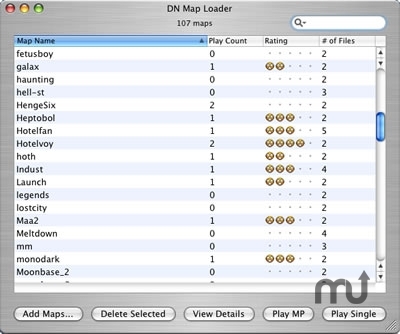 Is DN Map Loader really the best app in Gaming Tools and Utilities category? Will DN Map Loader work good on macOS 10.13.4? DN Map Loader lets you easily use third party maps and total conversions with the OS X version of Duke Nukem 3D, including Duke It Out In DC. Multi-player games across your local area network (WAN not tested). Set difficulty level in single player maps. Ratings system to rate your favorite maps. Play count shows how many times you've played a map. Open text files; Open map files in Build; Play voc, wav, midi files. A Group Extract utility for pulling files out of a .grp file. A Group Build utility for creating .grp files. Mac OS X 10.3 or later, and OS X version of Duke Nukem 3D. DN Map Loader needs a rating. Be the first to rate this app and get the discussion started! A Config Duke utility for changing screen resolution and enabling MouseLook.